A unique one-of-a-kind communications channel for pro athletes and their fans has been conceived by pro athletes that enable pro athletes and fans to create, manage and listen to 45 second voice messages via the iPhone, iPod Touch and Apple iPad. The new iOS app is called Gridiron Grunts; a grunt is an audio message sent within the users private network using unique push notification to alert the receiver to listen to the grunt and then reply with no email or SMS notifications required to send or hear a grunt. With the Gridiron Grunts app the user can listen to free “Pro grunts” from coaches, players, and personalities in categories like pre and post game insights, motivational and devotional, mid week updates, ringtones, and life and event related commentary. The Gridiron Grunts iOS app also allows the user to connect their Grunt Network account to both Twitter and Facebook, and you don’t have to register to browse through the free preview grunts. 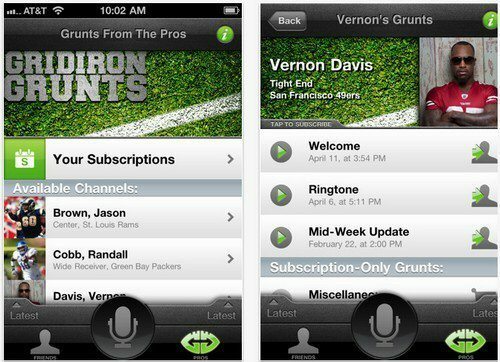 The Gridiron Grunts app for the Apple iPad, iPod Touch and iPhone running iOS 4.0 or above is a free app available from iTunes.